Citation: Quantum 2, 69 (2018). We develop a new computational tool and framework for characterizing the scattering of photons by energy-nonconserving Hamiltonians into unidirectional (chiral) waveguides, for example, with coherent pulsed excitation. 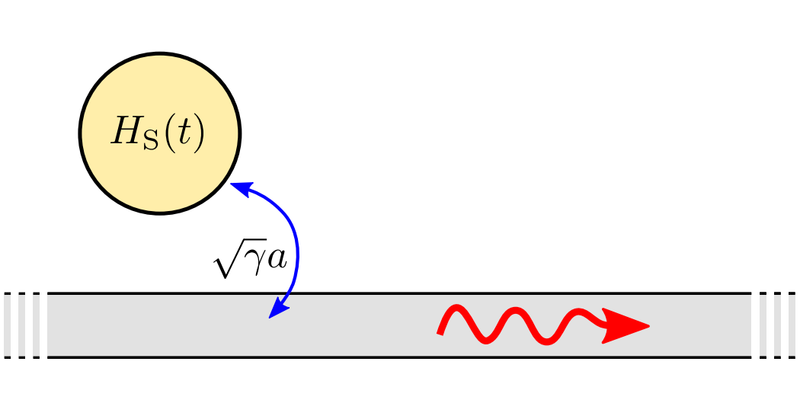 The temporal waveguide modes are a natural basis for characterizing scattering in quantum optics, and afford a powerful technique based on a coarse discretization of time. This overcomes limitations imposed by singularities in the waveguide-system coupling. Moreover, the integrated discretized equations can be faithfully converted to a continuous-time result by taking the appropriate limit. This approach provides a complete solution to the scattered photon field in the waveguide, and can also be used to track system-waveguide entanglement during evolution. We further develop a direct connection between quantum measurement theory and evolution of the scattered field, demonstrating the correspondence between quantum trajectories and the scattered photon state. Our method is most applicable when the number of photons scattered is known to be small, i.e. for a single-photon or photon-pair source. We illustrate two examples: analytical solutions for short laser pulses scattering off a two-level system and numerically exact solutions for short laser pulses scattering off a spontaneous parametric downconversion (SPDC) or spontaneous four-wave mixing (SFWM) source. Finally, we note that our technique can easily be extended to systems with multiple ground states and generalized scattering problems with both finite photon number input and coherent state drive, potentially enhancing the understanding of, e.g., light-matter entanglement and photon phase gates. JR Johansson, PD Nation, and Franco Nori. Qutip: An open-source python framework for the dynamics of open quantum systems. Computer Physics Communications, 183 (8): 1760-1772, 2012. 10.1016/​j.cpc.2012.02.021. Howard Carmichael. An open systems approach to quantum optics: lectures presented at the Université Libre de Bruxelles, October 28 to November 4, 1991, volume 18. Springer Science & Business Media, 2009. 10.1007/​978-3-540-47620-7. WB Gao, Parisa Fallahi, Emre Togan, Javier Miguel-Sánchez, and Atac Imamoglu. Observation of entanglement between a quantum dot spin and a single photon. Nature, 491 (7424): 426, 2012. 10.1038/​nature11573. Wang Yao, Ren-Bao Liu, and LJ Sham. Theory of control of the spin-photon interface for quantum networks. Physical review letters, 95 (3): 030504, 2005. 10.1103/​PhysRevLett.95.030504. BR Mollow. Pure-state analysis of resonant light scattering: Radiative damping, saturation, and multiphoton effects. Physical Review A, 12 (5): 1919, 1975. 10.1103/​PhysRevA.12.1919. CW Gardiner and MJ Collett. Input and output in damped quantum systems: Quantum stochastic differential equations and the master equation. Physical Review A, 31 (6): 3761, 1985. 10.1103/​PhysRevA.31.3761. Roy J Glauber. The quantum theory of optical coherence. Physical Review, 130 (6): 2529, 1963a. 10.1103/​PhysRev.130.2529. Roy J Glauber. Coherent and incoherent states of the radiation field. Physical Review, 131 (6): 2766, 1963b. 10.1103/​PhysRev.131.2766. Peter Domokos, Peter Horak, and Helmut Ritsch. Quantum description of light-pulse scattering on a single atom in waveguides. Physical Review A, 65 (3): 033832, 2002. 10.1103/​PhysRevA.65.033832. Alexandre Roulet and Valerio Scarani. Solving the scattering of N photons on a two-level atom without computation. New Journal of Physics, 18 (9): 093035, 2016. 10.1088/​1367-2630/​18/​9/​093035. Mikhail Pletyukhov and Vladimir Gritsev. Quantum theory of light scattering in a one-dimensional channel: Interaction effect on photon statistics and entanglement entropy. Physical Review A, 91 (6): 063841, 2015. 10.1103/​PhysRevA.91.063841. Mikhail Pletyukhov and Vladimir Gritsev. Scattering of massless particles in one-dimensional chiral channel. New Journal of Physics, 14 (9): 095028, 2012. 10.1088/​1367-2630/​14/​9/​095028. Yue Chang, Alejandro González-Tudela, Carlos Sánchez Muñoz, Carlos Navarrete-Benlloch, and Tao Shi. Deterministic down-converter and continuous photon-pair source within the bad-cavity limit. Physical review letters, 117 (20): 203602, 2016. 10.1103/​PhysRevLett.117.203602. T Shi and CP Sun. Lehmann-Symanzik-Zimmermann reduction approach to multiphoton scattering in coupled-resonator arrays. Physical Review B, 79 (20): 205111, 2009. 10.1103/​PhysRevB.79.205111. Tian Feng See, Changsuk Noh, and Dimitris G Angelakis. Diagrammatic approach to multiphoton scattering. Physical Review A, 95 (5): 053845, 2017. 10.1103/​PhysRevA.95.053845. Zeyang Liao, Xiaodong Zeng, Hyunchul Nha, and M Suhail Zubairy. Photon transport in a one-dimensional nanophotonic waveguide QED system. Physica Scripta, 91 (6): 063004, 2016. 10.1088/​0031-8949/​91/​6/​063004. Dibyendu Roy, Christopher M Wilson, and Ofer Firstenberg. Colloquium: Strongly interacting photons in one-dimensional continuum. Reviews of Modern Physics, 89 (2): 021001, 2017. 10.1103/​RevModPhys.89.021001. Huaixiu Zheng, Daniel J Gauthier, and Harold U Baranger. Waveguide QED: Many-body bound-state effects in coherent and fock-state scattering from a two-level system. Physical Review A, 82 (6): 063816, 2010. 10.1103/​PhysRevA.82.063816. Shanshan Xu and Shanhui Fan. Input-output formalism for few-photon transport. In Quantum Plasmonics, pages 1-23. Springer, 2017. 10.1007/​978-3-319-45820-5_1. Shanshan Xu and Shanhui Fan. Input-output formalism for few-photon transport: A systematic treatment beyond two photons. Physical Review A, 91 (4): 043845, 2015. 10.1103/​PhysRevA.91.043845. Shanhui Fan, Şükrü Ekin Kocabaş, and Jung-Tsung Shen. Input-output formalism for few-photon transport in one-dimensional nanophotonic waveguides coupled to a qubit. Physical Review A, 82 (6): 063821, 2010. 10.1103/​PhysRevA.82.063821. Tommaso Caneva, Marco T Manzoni, Tao Shi, James S Douglas, J Ignacio Cirac, and Darrick E Chang. Quantum dynamics of propagating photons with strong interactions: a generalized input-output formalism. New Journal of Physics, 17 (11): 113001, 2015. 10.1088/​1367-2630/​17/​11/​113001. Michael P Schneider, Tobias Sproll, Christina Stawiarski, Peter Schmitteckert, and Kurt Busch. Green's-function formalism for waveguide QED applications. Physical Review A, 93 (1): 013828, 2016. 10.1103/​PhysRevA.93.013828. David L Hurst and Pieter Kok. Analytic few-photon scattering in waveguide QED. Physical Review A, 97 (4): 043850, 2018. 10.1103/​PhysRevA.97.043850. Rahul Trivedi, Kevin Fischer, Shanhui Fan, and Jelena Vučković. Few-photon scattering and emission from open quantum systems. Manuscript in preparation. Diego Bombardelli. S-matrices and integrability. Journal of Physics A: Mathematical and Theoretical, 49 (32): 323003, 2016. 10.1088/​1751-8113/​49/​32/​323003. VI Yudson and P Reineker. Multiphoton scattering in a one-dimensional waveguide with resonant atoms. Physical Review A, 78 (5): 052713, 2008. 10.1103/​PhysRevA.78.052713. VI Yudson. Dynamics of integrable quantum systems. Zh. Eksp. Teor. Fiz, 88: 1757-1770, 1985. VI Yudson. Dynamics of the integrable one-dimensional system “photons+ two-level atoms”. Physics Letters A, 129 (1): 17-20, 1988. 10.1016/​0375-9601(88)90465-3. VI Rupasov. Complete integrability of the quasi-one-dimensional quantum model of dicke superradiance. JETP Letters, 36: 142-146, 1982. Zorawar S Bassi and André LeClair. A one-dimensional model for n-level atoms coupled to an electromagnetic field. Journal of Mathematical Physics, 40 (8): 3723-3731, 1999. 10.1063/​1.532922. VI Rupasov and VI Yudson. Exact dicke superradiance theory: Bethe wavefunctions in the discrete atom model. Zh. Eksp. Teor. Fiz, 86: 825, 1984. André LeClair. QED for a fibrillar medium of two-level atoms. Physical Review A, 56 (1): 782, 1997. 10.1103/​PhysRevA.56.782. Robert Konik and André LeClair. Scattering theory of oscillator defects in an optical fiber. Physical Review B, 58 (4): 1872, 1998. 10.1103/​PhysRevB.58.1872. A LeClair, F Lesage, S Lukyanov, and H Saleur. The Maxwell-Bloch theory in quantum optics and the kondo model. Physics Letters A, 235 (3): 203-208, 1997. 10.1016/​S0375-9601(97)00602-6. André Leclair. Eigenstates of the atom-field interaction and the binding of light in photonic crystals. Annals of Physics, 271 (2): 268-293, 1999. 10.1006/​aphy.1998.5874. William Konyk and Julio Gea-Banacloche. Quantum multimode treatment of light scattering by an atom in a waveguide. Physical Review A, 93 (6): 063807, 2016. 10.1103/​PhysRevA.93.063807. Anders Nysteen, Philip Trøst Kristensen, Dara PS McCutcheon, Per Kaer, and Jesper Mørk. Scattering of two photons on a quantum emitter in a one-dimensional waveguide: exact dynamics and induced correlations. New Journal of Physics, 17 (2): 023030, 2015. 10.1088/​1367-2630/​17/​2/​023030. Ben Q. Baragiola and Joshua Combes. Quantum trajectories for propagating fock states. Physical Review A, 96: 023819, Aug 2017. 10.1103/​PhysRevA.96.023819. Yu Pan, Daoyi Dong, and Guofeng Zhang. Exact analysis of the response of quantum systems to two-photons using a QSDE approach. New Journal of Physics, 18 (3): 033004, 2016. 10.1088/​1367-2630/​18/​3/​033004. Tao Shi, Darrick E Chang, and J Ignacio Cirac. Multiphoton-scattering theory and generalized master equations. Physical Review A, 92 (5): 053834, 2015. 10.1103/​PhysRevA.92.053834. Ben Q Baragiola, Robert L Cook, Agata M Brańczyk, and Joshua Combes. N-photon wave packets interacting with an arbitrary quantum system. Physical Review A, 86 (1): 013811, 2012. 10.1103/​PhysRevA.86.013811. Frank Verstraete and J Ignacio Cirac. Continuous matrix product states for quantum fields. Physical review letters, 104 (19): 190405, 2010. 10.1103/​PhysRevLett.104.190405. Tobias J Osborne, Jens Eisert, and Frank Verstraete. Holographic quantum states. Physical review letters, 105 (26): 260401, 2010. 10.1103/​PhysRevLett.105.260401. Pierre-Olivier Guimond, Mikhail Pletyukhov, Hannes Pichler, and Peter Zoller. Delayed coherent quantum feedback from a scattering theory and a matrix product state perspective. Quantum Science and Technology, 2017. 10.1088/​2058-9565/​aa7f03. Hannes Pichler and Peter Zoller. Photonic circuits with time delays and quantum feedback. Physical review letters, 116 (9): 093601, 2016. 10.1103/​PhysRevLett.116.093601. Gemma De las Cuevas, Norbert Schuch, David Perez-Garcia, and J Ignacio Cirac. Continuum limits of matrix product states. arXiv preprint arXiv:1708.00880, 2017. SJ Whalen, AL Grimsmo, and HJ Carmichael. Open quantum systems with delayed coherent feedback. Quantum Science and Technology, 2: 044008, 2017. 10.1088/​2058-9565/​aa8331. Jeremy L O'Brien, Akira Furusawa, and Jelena Vučković. Photonic quantum technologies. Nature Photonics, 3 (12): 687-695, 2009. 10.1038/​nphoton.2009.229. Chang-Woo Lee, Changsuk Noh, and Jaewan Kim. Effective formalism for open-quantum-system dynamics: Time-coarse-graining approach. Physical Review A, 97 (1): 012102, 2018. 10.1103/​PhysRevA.97.012102. Zhenshan Yang, Marco Liscidini, and JE Sipe. Spontaneous parametric down-conversion in waveguides: a backward Heisenberg picture approach. Physical Review A, 77 (3): 033808, 2008. 10.1103/​PhysRevA.77.033808. M Liscidini, LG Helt, and JE Sipe. Asymptotic fields for a Hamiltonian treatment of nonlinear electromagnetic phenomena. Physical Review A, 85 (1): 013833, 2012. 10.1103/​PhysRevA.85.013833. LG Helt, MJ Steel, and JE Sipe. Spontaneous parametric downconversion in waveguides: what's loss got to do with it? New Journal of Physics, 17 (1): 013055, 2015. 10.1088/​1367-2630/​17/​1/​013055. M Kamandar Dezfouli, MM Dignam, MJ Steel, and JE Sipe. Heisenberg treatment of pair generation in lossy coupled-cavity systems. Physical Review A, 90 (4): 043832, 2014. 10.1103/​PhysRevA.90.043832. Crispin Gardiner and Peter Zoller. Quantum noise: a handbook of Markovian and non-Markovian quantum stochastic methods with applications to quantum optics, volume 56. Springer Science & Business Media, 2004. Howard Mark Wiseman. Quantum trajectories and feedback. PhD thesis, University of Queensland, 1994. Rodney Loudon. The quantum theory of light. OUP Oxford, 2000. B Brecht, Dileep V Reddy, Ch Silberhorn, and MG Raymer. Photon temporal modes: a complete framework for quantum information science. Physical Review X, 5 (4): 041017, 2015. 10.1103/​PhysRevX.5.041017. Marlan O Scully and M Suhail Zubairy. Quantum optics, 1999. Tom Lancaster and Stephen J Blundell. Quantum field theory for the gifted amateur. OUP Oxford, 2014. Juan José García-Ripoll. Time evolution of matrix product states. New Journal of Physics, 8 (12): 305, 2006. 10.1088/​1367-2630/​8/​12/​305. Kevin Fischer. Derivation of the quantum-optical master equation based on coarse-graining of time. arXiv preprint arXiv:1712.00144, 2017. Heinz-Peter Breuer and Francesco Petruccione. The theory of open quantum systems. Oxford University Press on Demand, 2002. Jukka Kiukas, Mădălin Guţă, Igor Lesanovsky, and Juan P Garrahan. Equivalence of matrix product ensembles of trajectories in open quantum systems. Physical Review E, 92 (1): 012132, 2015. 10.1103/​PhysRevE.92.012132. Claude Cohen-Tannoudji, Jacques Dupont-Roc, Gilbert Grynberg, and Patricia Thickstun. Atom-photon interactions: basic processes and applications. Wiley Online Library, 1992. P Michler, A Kiraz, C Becher, W V Schoenfeld, PM Petroff, L Zhang, E Hu, and A Imamoglu. A quantum dot single-photon turnstile device. Science, 290 (5500): 2282-2285, 22 December 2000. 10.1126/​science.290.5500.2282. HJ Kimble, M Dagenais, and L Mandel. Photon antibunching in resonance fluorescence. Physical Review Letters, 39 (11): 691-695, 12 September 1977. 10.1103/​PhysRevLett.39.691. EB Flagg, A Muller, JW Robertson, S Founta, DG Deppe, M Xiao, W Ma, GJ Salamo, and C K Shih. Resonantly driven coherent oscillations in a solid-state quantum emitter. Nature Physics, 5 (3): 203-207, 25 January 2009. 10.1038/​nphys1184. B R Mollow. Power spectrum of light scattered by Two-Level systems. Physical Review, 188 (5): 1969-1975, 25 December 1969. 10.1103/​PhysRev.188.1969. Charles Santori, David Fattal, Jelena Vučković, Glenn S Solomon, and Yoshihisa Yamamoto. Indistinguishable photons from a single-photon device. Nature, 419 (6907): 594-597, 10 October 2002. 10.1038/​nature01086. CK Hong, ZY Ou, and L Mandel. Measurement of subpicosecond time intervals between two photons by interference. Physical Review Letters, 59 (18): 2044-2046, 2 November 1987. 10.1103/​PhysRevLett.59.2044. Yu-Ming He, Yu He, Yu-Jia Wei, Dian Wu, Mete Atatüre, Christian Schneider, Sven Höfling, Martin Kamp, Chao-Yang Lu, and Jian-Wei Pan. On-demand semiconductor single-photon source with near-unity indistinguishability. Nature Nanotechnology, 8 (3): 213-217, 2013. 10.1038/​nnano.2012.262. C Schneider, P Gold, C-Y Lu, S Höfling, J-W Pan, and M Kamp. Single semiconductor quantum dots in microcavities: bright sources of indistinguishable photons. In Engineering the Atom-Photon Interaction, pages 343-361. Springer, 2015. 10.1007/​978-3-319-19231-4_13. Zhiliang Yuan, Beata E Kardynal, R Mark Stevenson, Andrew J Shields, Charlene J Lobo, Ken Cooper, Neil S Beattie, David A Ritchie, and Michael Pepper. Electrically driven single-photon source. Science, 295 (5552): 102-105, 2002. 10.1126/​science.1066790. Julien Claudon, Joël Bleuse, Nitin Singh Malik, Maela Bazin, Périne Jaffrennou, Niels Gregersen, Christophe Sauvan, Philippe Lalanne, and Jean-Michel Gérard. A highly efficient single-photon source based on a quantum dot in a photonic nanowire. Nature Photonics, 4 (3): 174-177, 2010. 10.1038/​nphoton.2009.287. Sebastian Unsleber, Yu-Ming He, Stefan Gerhardt, Sebastian Maier, Chao-Yang Lu, Jian-Wei Pan, Niels Gregersen, Martin Kamp, Christian Schneider, and Sven Höfling. Highly indistinguishable on-demand resonance fluorescence photons from a deterministic quantum dot micropillar device with 74% extraction efficiency. Optics Express, 24 (8): 8539-8546, 2016. 10.1364/​OE.24.008539. A Schlehahn, A Thoma, P Munnelly, M Kamp, Sven Höfling, T Heindel, C Schneider, and S Reitzenstein. An electrically driven cavity-enhanced source of indistinguishable photons with 61% overall efficiency. APL Photonics, 1 (1): 011301, 2016. 10.1063/​1.4939831. N Somaschi, V Giesz, L De Santis, JC Loredo, MP Almeida, G Hornecker, SL Portalupi, T Grange, C Antón, J Demory, et al. Near-optimal single-photon sources in the solid state. Nature Photonics, 10 (5): 340-345, 2016. 10.1038/​nphoton.2016.23. Xing Ding, Yu He, Z-C Duan, Niels Gregersen, M-C Chen, S Unsleber, Sebastian Maier, Christian Schneider, Martin Kamp, Sven Höfling, et al. On-demand single photons with high extraction efficiency and near-unity indistinguishability from a resonantly driven quantum dot in a micropillar. Physical Review Letters, 116 (2): 020401, 2016. 10.1103/​PhysRevLett.116.020401. Peter Michler, editor. Quantum Dots for Quantum Information Technologies. Springer, 2017. 10.1007/​978-3-319-56378-7. Pascale Senellart, Glenn Solomon, and Andrew White. High-performance semiconductor quantum-dot single-photon sources. Nature Nanotechnology, 12 (11): 1026, 2017. 10.1038/​nnano.2017.218. JC Loredo, MA Broome, P Hilaire, O. Gazzano, I Sagnes, A Lemaitre, MP Almeida, P. Senellart, and AG White. Boson sampling with single-photon fock states from a bright solid-state source. Physical Review Letters, 118: 130503, Mar 2017. 10.1103/​PhysRevLett.118.130503. Igor Aharonovich, Dirk Englund, and Milos Toth. Solid-state single-photon emitters. Nature Photonics, 10 (10): 631-641, 29 September 2016. 10.1038/​nphoton.2016.186. Armand Rundquist, Michal Bajcsy, Arka Majumdar, Tomas Sarmiento, Kevin Fischer, Konstantinos G Lagoudakis, Sonia Buckley, Alexander Y Piggott, and Jelena Vučković. Nonclassical higher-order photon correlations with a quantum dot strongly coupled to a photonic-crystal nanocavity. Physical Review A, 90 (2): 023846, 25 August 2014. 10.1103/​PhysRevA.90.023846. C Sánchez Muñoz, E Del Valle, A González Tudela, K Müller, S Lichtmannecker, M Kaniber, C Tejedor, JJ Finley, and FP Laussy. Emitters of N-photon bundles. Nature Photonics, 8 (7): 550-555, 2014. 10.1038/​nphoton.2014.114. Itai Afek, Oron Ambar, and Yaron Silberberg. High-NOON states by mixing quantum and classical light. Science, 328 (5980): 879-881, 2010. 10.1126/​science.1188172. Kevin A Fischer, Lukas Hanschke, Jakob Wierzbowski, Tobias Simmet, Constantin Dory, Jonathan J Finley, Jelena Vučković, and Kai Müller. Signatures of two-photon pulses from a quantum two-level system. Nature Physics, 13 (7): 649, 2017a. 10.1038/​nphys4052. Kevin A Fischer, Lukas Hanschke, Malte Kremser, Jonathan J Finley, Kai Müller, and Jelena Vučković. Pulsed rabi oscillations in quantum two-level systems: beyond the area theorem. Quantum Science and Technology, 3 (1): 014006, 2017b. 10.1088/​2058-9565/​aa9269. Kevin A Fischer, Kai Müller, Konstantinos G Lagoudakis, and Jelena Vučković. Dynamical modeling of pulsed two-photon interference. New Journal of Physics, 18 (11): 113053, 2016. 10.1088/​1367-2630/​18/​11/​113053. Joel Lindkvist and Göran Johansson. Scattering of coherent pulses on a two-level system-single-photon generation. New Journal of Physics, 16 (5): 055018, 2014. 10.1088/​1367-2630/​16/​5/​055018. CK Law and JH Eberly. Analysis and interpretation of high transverse entanglement in optical parametric down conversion. Physical review letters, 92 (12): 127903, 2004. 10.1103/​PhysRevLett.92.127903. CK Law, IA Walmsley, and JH Eberly. Continuous frequency entanglement: effective finite hilbert space and entropy control. Physical Review Letters, 84 (23): 5304, 2000. 10.1103/​PhysRevLett.84.5304. Daniel R Blay, MJ Steel, and LG Helt. Effects of filtering on the purity of heralded single photons from parametric sources. Physical Review A, 96 (5): 053842, 2017. 10.1103/​PhysRevA.96.053842. Xiyuan Lu, Wei C Jiang, Jidong Zhang, and Qiang Lin. Biphoton statistics of quantum light generated on a silicon chip. ACS Photonics, 3 (9): 1626-1636, 2016. 10.1021/​acsphotonics.6b00204. Jacob Mower and Dirk Englund. Efficient generation of single and entangled photons on a silicon photonic integrated chip. Physical Review A, 84 (5): 052326, 2011. 10.1103/​PhysRevA.84.052326. Joshua W Silverstone, Raffaele Santagati, Damien Bonneau, Michael J Strain, Marc Sorel, Jeremy L O’Brien, and Mark G Thompson. Qubit entanglement between ring-resonator photon-pair sources on a silicon chip. Nature communications, 6, 2015. 10.1038/​ncomms8948. Lorenzo Pavesi and David J Lockwood. Silicon Photonics III: Systems and Applications, volume 122. Springer Science & Business Media, 2016. Nicolas Quesada and John Sipe. The effects of self-and cross-phase modulation in the generation of bright twin beams using spdc. In CLEO: Science and Innovations, pages JW2A-23. Optical Society of America, 2017. 10.1364/​CLEO_AT.2017.JW2A.23. Z Vernon and JE Sipe. Spontaneous four-wave mixing in lossy microring resonators. Physical Review A, 91 (5): 053802, 2015. 10.1103/​PhysRevA.91.053802. Shuo Sun, Hyochul Kim, Glenn S Solomon, and Edo Waks. A quantum phase switch between a single solid-state spin and a photon. Nature Nanotechnology, 11 (6): 539-544, 2016. 10.1038/​nnano.2015.334. Chiranjeeb Roy and Stephen Hughes. Influence of electron-acoustic-phonon scattering on intensity power broadening in a coherently driven quantum-dot-cavity system. Physical Review X, 1 (2): 021009, 2011. 10.1103/​PhysRevX.1.021009. Kai Müller, Kevin A Fischer, Armand Rundquist, Constantin Dory, Konstantinos G Lagoudakis, Tomas Sarmiento, Yousif A Kelaita, Victoria Borish, and Jelena Vučković. Ultrafast polariton-phonon dynamics of strongly coupled quantum dot-nanocavity systems. Physical Review X, 5 (3): 031006, 2015. 10.1103/​PhysRevX.5.031006. Chris Gustin and Stephen Hughes. Influence of electron-phonon scattering for an on-demand quantum dot single-photon source using cavity-assisted adiabatic passage. Physical Review B, 96 (8): 085305, 2017. 10.1103/​PhysRevB.96.085305. A. M. Basharov, "Models of the Dynamics of Spatially Separated Broadband Electromagnetic Fields Interacting with Resonant Atoms", Soviet Journal of Experimental and Theoretical Physics 126 3, 310 (2018). A. I. Trubilko and A. M. Basharov, "Kinetic Equation for the Density Matrix of Atoms in the Field of a Broadband One-Photon Packet Taking into Account the Non-Wiener Dynamics", Soviet Journal of Experimental and Theoretical Physics 126 5, 604 (2018). Jonathan A. Gross, Carlton M. Caves, Gerard J. Milburn, and Joshua Combes, "Qubit models of weak continuous measurements", arXiv:1710.09523 (2017). Francesco Ciccarello, "Collision models in quantum optics", Quantum Measurements and Quantum Metrology 4 1, 7 (2017). Rahul Trivedi, Kevin Fischer, Shanshan Xu, Shanhui Fan, and Jelena Vuckovic, "Few-photon scattering and emission from low-dimensional quantum systems", Physical Review B 98 14, 144112 (2018). Lukas Hanschke, Kevin A. Fischer, Stefan Appel, Daniil Lukin, Jakob Wierzbowski, Shuo Sun, Rahul Trivedi, Jelena Vučković, Jonathan J. Finley, and Kai Müller, "Quantum dot single-photon sources with ultra-low multi-photon probability", npj Quantum Information 4 1, 43 (2018). Kevin Fischer, "Derivation of the quantum-optical master equation based on coarse-graining of time", Journal of Physics Communications 2 9, 091001 (2018). Anita Dąbrowska, Gniewomir Sarbicki, and Dariusz Chruściński, "Quantum trajectories for a system interacting with environment in N-photon state", Journal of Physics A: Mathematical and Theoretical 52 10, 105303 (2019). Kevin A. Fischer, Rahul Trivedi, and Daniil Lukin, "Particle emission from open quantum systems", Physical Review A 98 2, 023853 (2018). The above citations are from Crossref's cited-by service (last updated 2019-04-25 11:08:05) and SAO/NASA ADS (last updated 2019-04-25 11:08:07). The list may be incomplete as not all publishers provide suitable and complete citation data.